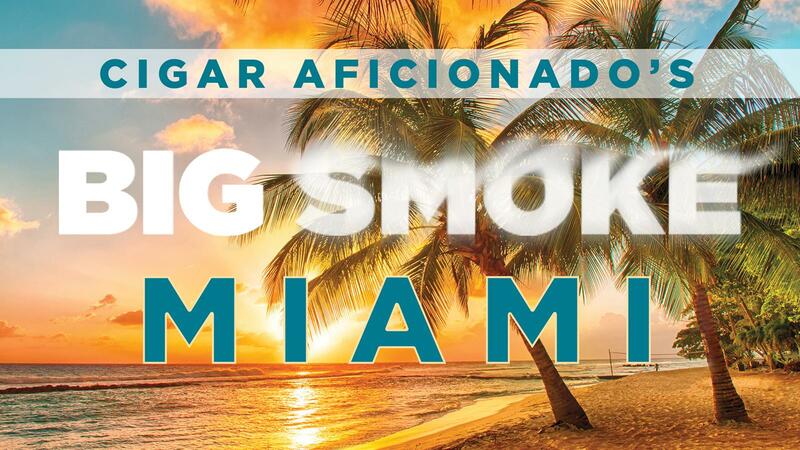 Cigar Aficionado's Big Smoke is coming to the sunny shores of Miami Beach on April 7—and there's still time for cigar lovers to take part in the festivities. The event will be held at the iconic Fontainebleau Hotel in Miami Beach and will offer a unique opportunity to meet some of the cigar world's biggest stars while enjoying premium cigars, libations and a delicious buffet. Tickets to the Big Smoke Miami—and the VIP option that allows early access to the event—are on sale now. The ticket price includes 35 premium cigars, dinner, and a host of designer cocktails, delicious beers and fine spirits. Ernesto Perez-Carrillo, Lissette Perez-Carrillo and Jose Blanco of EPC Cigar Co.
Alan Rubin of Alec Bradley Cigar Co.
Régis Broersma of General Cigar Co.
Attendees will also have the chance to light up among like-minded aficionados on the Fontainebleau Hotel's beautiful outdoor terrace, located adjacent to the cigar booths. The patio will also feature bars and lounges from some of the premium spirits brands participating in the event, like Bacardi 8, D'USSE, Dewar's and Hatuey. For more information on this one-of-a-kind experience, visit the FAQ section located on the homepage of www.bigsmokemiami.com.